KAWS: FAR FAR DOWN, installation view, Contemporary Art Museum St. Louis, May 5–August 13, 2017. Photo: Dusty Kessler. The multifaceted artist KAWS is renowned for his inspired manipulations of pop-culture imagery, a practice that began in the early 1990s when the artist painted over existing advertisements in cities around the world. Since that time KAWS’s practice has encompassed realms of both art and design, extending into collaborations with such global brands as Comme des Garçons, Nike, Supreme, and Uniqlo. For FAR FAR DOWN, the artist creates a site-specific painting on CAM’s 60-foot long Project Wall, the large-scale work serving as a backdrop for three new major paintings. In the Museum’s courtyard, KAWS debuts the most recent permutation from his sculpture series, TOGETHER—bronze painted figures in a consoling embrace. TOGETHER is immediately endearing, and at the same time evokes pathos and contemplation. The paintings on view on the Project Wall deliver a sustained visual display of clashing patterns and vibrant colors, with barely recognizable popular figures inlaid within the scenes as deceptively as camouflage. The title of the exhibition and the eponymous painting implies physical or emotional descent, although the status of the concealed forms within the work are open to conjecture. KAWS draws profound links between popular culture, commercialization, and the human condition. Rather than pose a critique of mass culture, however, he makes associations with a wide audience through his identifiable imagery. KAWS incorporates a playful style with a serious formal aesthetic—his dedication to craft, respect for the handmade, and lightness of spirit all conjoin. 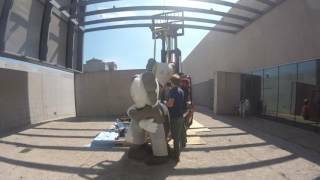 KAWS: FAR FAR DOWN is organized for the Contemporary Art Museum St. Louis by Lisa Melandri, Executive Director.